These adult editions of J.K. Rowling's Harry Potter novels have been stylishly redesigned to showcase beautiful jackets by renowned woodcut artist Andrew Davidson. 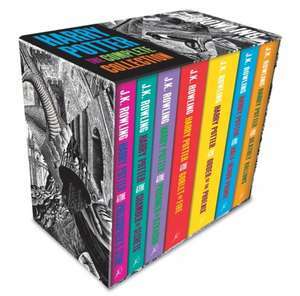 This spectacular box set includes all seven novels and is perfect for Harry Potter novices and collectors alike.Contains (in reading order): Harry Potter and the Philosopher's Stone, Harry Potter and the Chamber of Secrets, Harry Potter and the Prisoner of Azkaban, Harry Potter and the Goblet of Fire, Harry Potter and the Order of the Phoenix, Harry Potter and the Half-Blood Prince, and Harry Potter and the Deathly Hallows. J.K. Rowling is the author of the record-breaking, multi-award-winning Harry Potter novels. Loved by fans around the world, the series has sold over 500 million copies, been translated into 80 languages, and made into eight blockbuster films. She has written three companion volumes in aid of charity: Quidditch Through the Ages and Fantastic Beasts and Where to Find Them (in aid of Comic Relief and Lumos), and The Tales of Beedle the Bard (in aid of Lumos), as well as a screenplay inspired by Fantastic Beasts and Where to Find Them, which marked the start of a five-film series to be written by the author. She has also collaborated on a stage play, Harry Potter and the Cursed Child Parts One and Two, which opened in London's West End in the summer of 2016 and on Broadway in early 2018. In 2012, J.K. Rowling's digital company Pottermore was launched, where fans can enjoy news, features and articles, as well as original content from J.K. Rowling. She is also the author of The Casual Vacancy, a novel for adult readers, and the Strike crime series, written under the pseudonym Robert Galbraith. She has received many awards and honours, including an OBE and Companion of Honour, France's Légion d'honneur, and the Hans Christian Andersen Award.